Soft and lovely earth tones bring quiet elegance to this one-of-a-kind piece. 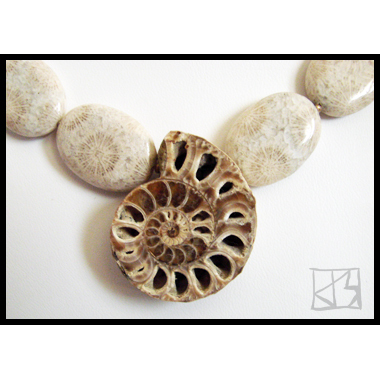 Large ovals (25mm x 18mm) carved from fossilized coral beds have their own intrinsic beauty with flower-like patterning, and they lead the eye to the fabulous centerpiece � an excavated ammonite fossil from exotic Morocco. This ancient nautilus shell (37mm x 31mm) has its own quiet secrets in every chamber... much like a human heart! 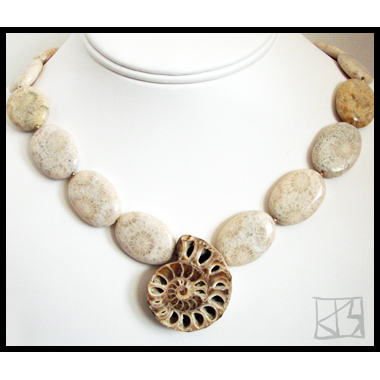 Wear a piece of prehistoric beauty unearthed and bring your own inner nature to the surface...!